Essenza LED Downlights use ELV or Triac system for dimming. 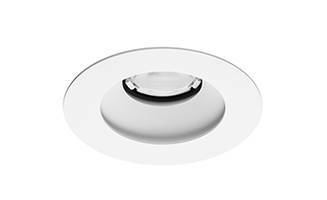 Available in 12 W and 18 W models in matte white finishing, Essenza LED downlights are designed for shallow plenums down to 4 in. Delivering 875 lumens of light with 97 CRI, units offer 15-60º beam spreads and is operated with 120V or 277V electronic constant current LED driver. Offered in 2700K or 3000K color temperatures, units are constructed using die-cast optical head, trim, heat sink and spring steel retaining clips. Designed to elevate the experience of urban residential luxury and hospitality settings, Amerlux introduces Essenza LED, a small luminaire offered in a round or square trim design for downlights, wall washers and shower lights. Essenza is designed for shallow plenums down to 4" while offering the aesthetics, flexibility, nanotechnology engineering and code-ready attributes to complete any design perfectly. "Our new Essenza is the perfect LED downlight solution for hotels and residential high-rise projects," explains Amerlux CEO/President Chuck Campagna. "This new miniature luminaire is engineered with a shallow frame that fits a 4-inch plenum depth and is available in a wide range of styles and functions that offer designers the ability to complete any interior décor scheme." Downlight Trims are designed for use with integral LEDs to maximize performance in gypsum board and grid ceilings. Fixtures are offered with a universal frame for both round and square apertures. The family includes Downlights, Adjustable Accent, Wall Washer, Lensed Shower Trims and Pinhole Downlight trims. Essenza downlights are available in 12-watt and 18-watt models. 12-watt versions are IC/AT-rated and Chicago Plenum-approved (CCEA). The fixtures are offered in 2700K or 3000K color temperatures and deliver up to 875 lumens with a high 97 CRI. Beam spreads range from 15-60º while the fixtures use an electronic constant current LED driver for 120v or 277v systems. Dimming is standard with an ELV or Triac system. Constructed with die-cast optical head, trim, heat sink and spring steel retaining clips for use in T-grid or sheet rock ceilings up to 1" thickness max. All are available in a matte white finish. Amerlux creates lighting designed around its customers and will stop at nothing to help realize their vision. Amerlux works closely with customers every step of the way, from design through construction, to ensure total success and total satisfaction. Amerlux is fueled by a passion to consistently deliver in a fraction of the time of competitors, even on short-run custom orders, and that includes making sure every order is accurate, every product performs flawlessly, and every customer is successful. Amerlux speaks the language of light for design and construction professionals around the world by manufacturing a broad array of optically superior, energy efficient lighting solutions for the retail, supermarket, hospitality, commercial and exterior lighting markets. Amerlux products and services include track lighting, recessed downlighting and multiples, pendants, linear systems, and custom lighting solutions, as well as support for energy reduction plans that can be used as a guide to state, city and local utility rebate programs for maximum energy savings and utility incentives. The company's domestic and international clients receive the support of Amerlux's highly trained specification sales force, as well as expert service from initial design to on-time delivery made possible by strategically located manufacturing, warehousing and shipping locations.